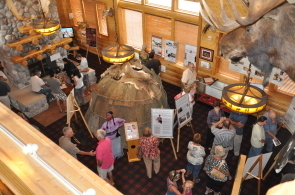 Guests mingle during the exhibit’s grand opening. Among the most popular attractions is the authentic wigwam. The grand opening of the Odawa Warriors’ Journey on Aug. 12, 2011, at Pellston Regional Airport drew more than 110 guests, who got a first look at the historical presentation of key people and events that shaped this region’s — and the country’s — history. Visitors can expect to meet key historical figures from Odawa, French and British history; watch a movie based on a French soldier’s journal during the time of the French and Indian War (1750-1761); and tour an authentic wigwam. The exhibit, a project of the Emmet County Historical Commission, is open daily from 8 a.m. to 8 p.m., at no charge. Signs in the airport will direct visitors to the Trophy Room, where the exhibit components will be arranged, including interpretive display boards, a self-guided cellphone tour and life-size figures telling their own stories from the time period. Click here for more information about the exhibit and the story it has to tell.